Book and catalog design and production have become mainstays at Sincere Design, and because we understand what printers need in order to do their job well, we have been able to get beautifully printed material at a very good price for our clients. 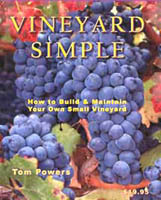 In the example of Tom Powers' book, "Vineyard Simple - How to Build and Maintain Your Own Small Vineyard", I worked with Tom's outline to produce the final text. I then added drawings and photographs, selected the type and composed the book and the cover. Finally, I converted the Quark files to .PDF and delivered them to the printer. Some of the drawings and photographs for this book can be seen on the Book Illustration Pages. 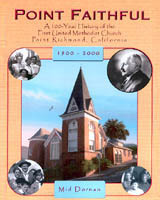 Point Faithful - A 100 year history of the First United Methodist Church of Point Richmond" by Mid Dornan is a fascinating romp through historic Point Richmond's checkered past. In both of the examples above, "Digital to Plate" saved the client money, ensured the highest possible quality, and delivered the project in the swiftest possible manner. Naturally we do online catalogs, but since the need for printed catalogs isn't likely to go away soon, we cleverly stayed ahead of the curve and now offer digital to plate technology. Having the latest versions of InDesign and Quark means you aren't limited in your choice of printers and you get the best quality at the best price.